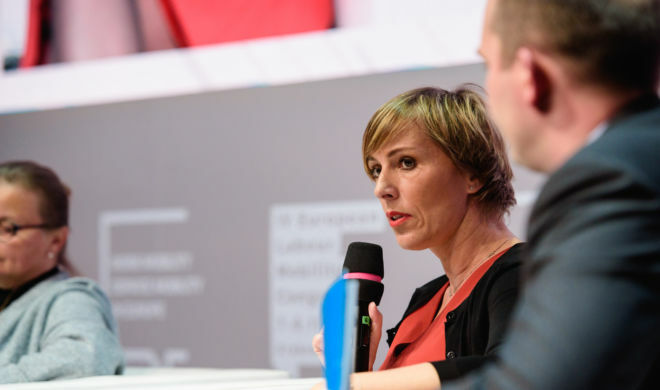 Martina Dlabajova, shadow repporteur on the Revision of the Posting of Workers Directive, was an active participant of the debate with the Members of European Parliament at this year’s ELMC. Her arguments met with the approval of most of the Central and East European countries, were warmly welcomed by the publicity. The notion of posting of workers is very often confused with the use of social dumping. Unlike many politicians, who confuse ideas in public debate, Ms Dlabajova has a very strict attitude towards these two notions. – I am fully convinced that posting of workers is beneficial to both sending and receiving States. It is also beneficial to social convergence, economic growth and convergence of the salaries. It is an legal activity that should never be confused with a social dumping. It is commonly believed, that proposal of the revision will be beneficial to the very little number of Member States. – The revision should be beneficial to the entire EU. There should be neither winners nor losers. It is a delicate matter for the entire EU and we need to seek for a compromise. Martina Dlabajova share same concerns as many observers – she doubts that we will find a compromise. She remains open to the dialogue and quotes one of the statements made at the IV ELMC “ the more we know about posting of workers, the more we can discuss and improve it”.